Did you hear? 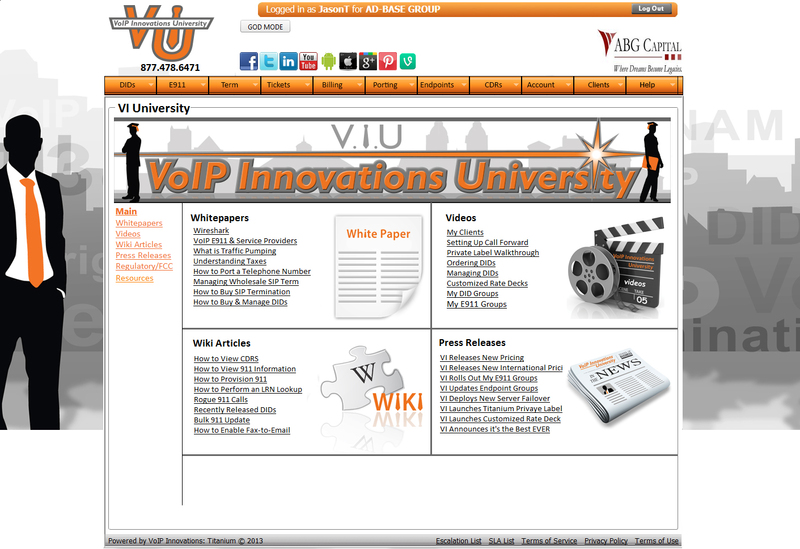 We've finally announced a release date for VoIP Innovations University (VIU)! On October 1, our customer will have an all access pass to our exclusive VIU platform. They'll be able to find it once they log into their BackOffice account and drop down the Help tab. People who are in the VoIP Industry understand that there is a great deal of information out there and keeping track of this information can get tough if there are tons of places to look. Not only do people have to be aware of general industry related things, but there is also specific VoIP Innovations information that needs to be available at the customers’ finger tips. By creating this VIU platform, we'll gather all of this material and put it in an easy to navigate interface that empowers our customers to be informed decision makers. After all, we want our customers to know what's out there so that they succeed! Now let's get into some nitty gritty details of VoIP Innovations University. It will feature four main sections: White Papers, Videos, Wiki Articles and Press Releases. If a customer opens one of these sections, they’ll find a breakdown of information based on different categories. For example, the Videos section has a category for DIDs, E911, and General Information. Not only have we added the category feature to help customers find content, but we've also added a search bar so customers can search for a specific term rather than looking through all categories to find what they need. Here's a sneak peak of what VoIP Innovations University looks like in the BackOffice! October 1 is the release date for VIU 1.0, but believe me we're not stopping there. VIU 2.0 is going to be focused on expanding upon the capabilities of VIU and making it more robust for our customers. We plan on integrating tracking tools so that customers can be rewarded with promotional items (orange ties, keychains, mini VI Guy cardboard cutouts, etc.) or account credits just for their participation! We also plan to incorporate industry resources such as voip-info.org, voipfraud.net and whichvoip.com. We recognized early on that having an aggregation based business model has been successful for our own company. Now we want to take that knowledge and start using the same concept to help our customers stay informed and succeed in their own business ventures in the VoIP industry.